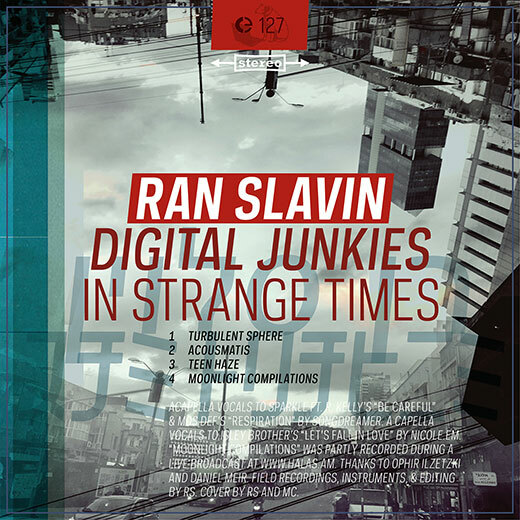 The brand-new Ran Slavin’s album, which was just released on the label Crónica, sounded incredibly awesome in my media player. I’ve always been interested in his music, but I was surprised to discover that Digital Junkies in Strange Times was even more intriguing than his previous work. Not long ago, Data.Wave hosted an interview with Ran Slavin that really highlighted aspects of his talent as a video-audio designer, but a lot was left out. Listening to Digital Junkies in Strange Times convinced me one again, that there are no limits to a real artist’s creativity. I’ve never heard anything like this and I can’t compare Digital Junkies in Strange Times to anything else, but I would dare to guess that a live show with a set like this would knock people over and turn their minds upside down. Ran Slavin’s method of shaping the sound is very subtle, it walks the thin line of the limits of our perception, but his music doesn’t quite cross this border. to more of this. The thing that begins from the third track, Teen Haze, really switches the mood and gets us ready for the very impactful fourth track Moonlight Compilations, that is actually a bit more than just a track; it’s a recorded live improvisation on the radio Halas, the overall duration of which is 41:34. Moonlight Compilations is a volatile mix, an incredible clash of genres that transports us to another dimension. It has an incredible amount of various instruments, futuristic structures, field recordings, creating a real digital Metropolis, our natural habitat. It’s difficult to describe all this just with text, because this intellectual experiment invokes very strong interior emotions and feelings. Anyone can listen to this release now as the album Digital Junkies in Strange Times is available for free download, so why not get it while you still can! This entry was posted in Reviews and tagged 127, Ran Slavin. Bookmark the permalink. Comments are closed, but you can leave a trackback: Trackback URL.